You might ask the questions: "What are field trials, and what does the horse have to do with field trials?" It is first important to understand what field trials are and then understand why horses often play an important part in this sport even though the dogs are the animals competing. Even though field trials do not involve judging horses, the horses often do play a critical role. The horse's role will be visited below. First, there is an explanation of what field trials are all about--different in various countries and often complicated to understand. However, before you start reading one might say that field trials, simply stated, are a competition to determine who has the best performing bird dog on a particular day of competition. In the southern United States the term bird dog refers to dog breeds such as the pointer, English setter, Red setter, German short hair pointer, Nova Scotia Duck-Tolling Retriever, Brittany, and other pointing breeds. A field trial that is held under the auspices of the Kennel Club, the UK's governing body in respect of working gun dogs, can be described as a competition to assess the work of gun dogs in the field. By definition this means that all field trials are held on live, unhandled game that is shot for the purpose of that field trial. Game that has been handled in any way, whether it be live or dead game, may not be used for testing dogs in any part of a field trial. The only exception to this rule is where dead game may be used in the conduct of a water test at a field trial. The reason this exception exists it to acknowledge the fact that game will not necessarily be shot over water, although for dogs to qualify for titles in field trials will be required to demonstrate their ability to retrieve from water. Gun dog clubs and societies that are registered with the Kennel Club and which have been authorized to org anise and run field trials may do so, provided that a licence is issued to that club or society for every field trial. Field trials not licensed by the Kennel Club are liable to be deemed as unrecognized canine events. This is a stake in which the dogs have the opportunity of gaining a qualification towards the title of Field Trial Champion (FTCh) and towards entry in the Championships or Champion Stake for its breed. This is open to all dogs of a specified breed or breeds without restriction as to the age of the dog, but which may be restricted by other conditions that are deemed necessary by the organ ising club or society. Four placements plus a Reserve JAM and JAMs (Judges Award of Merit). The judges at field trials are appointed by the Field Trial Secretary of the organ ising club or society, after having been instructed to do so by the committee of the club or society. It is considered and honour to be asked to judge at a field trial and the highest standard of judging is expected from appointed judges. The club or society running the trial must satisfy itself that the persons being invited to judge at a trial have practical experience of both field trials and sporting shooting. Judges may not shoot at a stake at which they are judging nor may they enter a dog for competition at that trial (except for retriever stakes where someone else may handle their dog in a stake other than the one the owner has been asked to judge). Judges are classified as either A or B Panel Judges and Non-panel (NP). However, an A Panel Judge must be present at all field trials. Judges are appointed to panels after recommendation from a Field Trial Secretary of a club or society which is approved to hold Open Stakes for the appropriate sub-group of gun dogs for which he or she has judged within the past three years. The opinion of all previous A Panel judges with whom he or she has judged field trials over the previous three years will be sought by the Kennel Club's Field Trial Sub-Committee. The experience of the perspective Panel Judge over the last number of years is taken into account but this must include having judged at trials for at least two different clubs or societies and with at least five different A Panel co-judges. Dogs competing in retriever or spaniel field trials must not wear a collar of any kind when under the order of the judges. Leads can be used when dogs are not under the order of the judges, but these must be removed prior to the dogs entering the competition line. Any dog that, in the opinion of the judges, does not reach the required standard for the breed will not receive an award. Judges will eliminate dogs from the trial if they have committed and "eliminating fault." Where the judges eliminate a dog for hard mouth, the handler must be given the opportunity of examining the game in the presence of the judges. Their decision, however, is final and binding. Whilst dogs are required to be obedient and respond to its handler's signals, good game finding dogs will be scored higher than those dogs that need handled to the game. Usually the better dogs require less handling, appear to have an instinctive knowledge of direction and make a difficult find look simple. In the UK, Judges will call up dogs that are performing indifferently on a runner and another dog will be tried on it. The work of subsequent dogs on the runner will be assessed in the order in which they are tried. Missed game that is picked by the second or subsequent dog constitutes an "eye wipe." All "eye wipes" will be treated on their merits but dogs that have had their "eye wiped" during the body of the stake will be discarded by the judges. Where a dog shows ability by acknowledging the fall of game and making a workmanlike job of the line to the fall, it should not be barred from the awards by failing to retrieve the game if that game is not collected by another dog, tried by the judges on the same game. All retrieved game is examined by the judges for signs of "hard mouth." Because hard mouthed dogs seldom give a visible sign of hardness by damaging the skin of game, the retrieved game should be placed in the palm of the hand, breast upwards and head forwards. Judges will examine the rib gage of the game, looking for any signs of the ribs being crushed by running the index finger and thumb along each side of the rib cage. If a judges suspects hard mouth, he or she would normally consult with their co-judge who will also examine the game. Where judges are in agreement that the damage has been caused by the dog crushing and not by the fall or the shot, the handler will be given the opportunity of inspecting the game in the presence of the judges. The decision of the judges is final and the dog will be eliminated from the trial. Definitions of field trials differ based on the organizations that sanction them. The above definition for trials in Great Britain, for example, is quite different from, for example, FDSB (Field Dog Stud Book) field trials for pointers, English setters, German short hair pointers and Brittanys in the United States. The FDSB is the oldest stud book in the USA. The American Field publishes a weekly newspaper announcing field trials (open and amateur) in the USA, Canada and Japan and reporting the results of previous trials. Stakes in field trials are for puppies, derbies and mature dogs for which there are several placements in each stake. There are also championships for which dogs must qualify by winning field trial placements in order to compete in them. They generally award a winner and runner-up winner but not always. There are primarily walking Shooting Dog trials (including grouse and woodcock trials, sometimes called 'coverdog' trials held in areas where those birds exist), Horseback Shooting Dog and All Age trials. Today, All Age generally refers to a particular type of stake and the dogs that run in those stakes which include open championships run on the Canadian prairies (i.e., Dominion and The Manitoba All Age Championships), the endurance championships of the south (i.e. The Southern, The Continental, The Free-for-All, The Alabama, The National Field Trial Championships) Many of these championships are over 100 years old. The National Field Trial Championship is perhaps the most famous endurance trial. It has, for many years been run on the Ames Plantation in Grand Junction, Tennessee. Grand Junction is the home of the Bird Dog Foundation and the Bird Dog Museum. The National Championship is a three hour long stake for which the dogs must qualify in other trials throughout the year in order to compete. Each year there is only one champion. A dog's field trial wins are recorded with the FDSB and are a permanent part of their record shown on their pedigree. Please visit The AFTCA and the American Field websites for more information on FDSB field trials for pointing dogs. It should not come as a surprise to anyone that horses and dogs work well together. The famous dalmatians were known as fire dogs. They followed coaches pulled by horses. Jack Russell Terriers are used in fox hunting to ferret out the fox. The working terrier comes in many forms from the specialized breeds like the Patterdale, Fell types, Jack Russell, Border, Staffordshire and Pitbull--to the hybrids of these breeds. English Foxhounds run in front of the hunter horses. Horses carry riders to track people for many reasons. Hounds are used to pick up the scent. The list goes on and on. Now that field trials have been explained above, we can visit the importance of using the horse in this endeavor. Even though field trials do not involve judging the horses, the horses play a critical role and must be up to the task. All gaited breeds are represented: Paso Fino, Spotted Saddle Horses, Rocky Mountain Horses, Kentucky Mountain Horses and Mountain Pleasure Horses. Even gaited mules and grade crosses (such as the Walkaloosa and others) are used. However, the Tennessee Walking Horse is the most commonly used breed for Field Trails It should be noted that although pacers are gaited they are considered undesirable for use in field trials as are trotting breeds in most quarters. A 4-beat gait is the gait of choice. Mechanized modes of transportation are forbidden, so the horse is the perfect mode of transportation. Gaited horses (4-beat gait) are the mount of choice. The horse must be easy to trailer. No bad habits in this regard! The judges, handler's, bird planter's and Field Marshall (gallery horse - The field Marshall's job is to control the gallery use a horse in field trials. 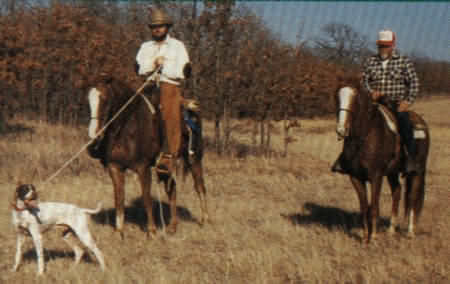 Field trials where horses are used are almost exclusively for pointer breeds. Field Trials that use Beagles, on occasion, for pack trials. The quick movement of the dog often require the judges to follow on horseback. It is difficult to keep up on foot. The vantage point from on top of the horse provides the judges with a better view of how each dog works within the pack. Field Trials using Spaniels and Retrievers do not uses horses. Horses are used by The American Kennel Club Hunting Tests for the pointing breeds. Only the judges and bird planters in these events use horses. Judges are often on the course all day, following the dogs. The horse offers a better view to the judge and eliminates all that walking for them. Roading - Roading is a method to condition a dog. The dog wears a harness. A thirty-foot rope is attached to the harness. Then the rope is attached to the saddle. The dog is encouraged to lean into the rope and harness and pull hard. The rider and horse follow. Thirty minutes of roading is the equivalent of an hour of free running. The dog usually stays out in front of the horse so the horse must tolerate the rope crossing over his chest as the dog moves from the left to the right. Roading is also used to excite and educate the dogs. In American Field Trails you can road dogs in the gallery behind the dogs in a brace. The dogs being roaded become fired up by watching the other dogs work as the gun is fired and the bird is flushed. Roading is also used when a dog makes a mistake and you are far out on the course. If the judge orders you up, the dog can be roaded back to the club house. A dog that has been lost on the course and later found can be roaded back. This does not interfere with the new brace of dogs.